Description Can you manage a large merchant fleet during the Caribbean colonization? Stave off the dangerous pirates, avoid the treacherous monsters, and the weather is not always in your favor! Your aim is to get the ships into the harbors and after unloading to send them away. Click the mouse on a ship and draw its path. Don't collide ships. Press ANCHOR button and then choose a ship to stop it. Do it again to allow the ship to continue. Press the BOOST button and then choose a ship to increase its speed. 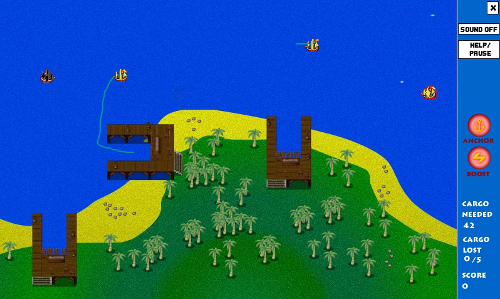 Pirates will destroy ships close to them, or in later levels they can also shoot guns. To destroy them click next to them to fire a missile if you have a gun. Tornadoes and tsunamis will disorient ships, stay away from them. There are other merchant's ships - you can't control them, so just stay away from them. Watch out for the dangerous sea monsters!